To create the best raised garden design, it’s best to use a design system. This ensures that you get the best results from your garden. 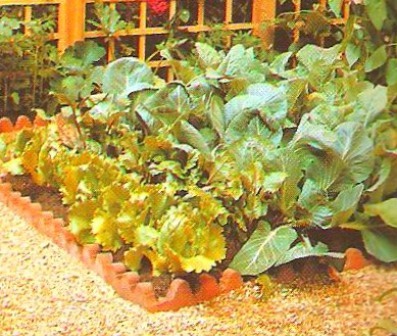 A design system can also allow you to plant vegetables in your raised garden easily. In your raised garden design, you can incorporate a set of rectangular shaped beds that are divided by permanent pathways for easy accessibility. Gravel can be used to cover the pathways. Ensure that your beds are narrow enough to reach your veggie plants from your pathways as this will make it easier for you to garden. In my opinion, it’s best to have the beds running in a north-south position if possible. Place some organic matter on top the soil and leave it to settle for at least a couple of weeks before you start planting or sowing seeds. You can begin in autumn or early winter when you have a layer of organic matter or compost that’s already worked into the soil surface. When choosing your vegetables, it’s best to choose varieties that mature early along with the dwarf varieties. Usually the yield from each plant will be less than a traditional long row of plants. However, you’ll be surprise that the yield from each square foot within the bed will normally be more. Now when planting your vegetables in the bed, you can space them at the same distance from each other in all directions. The spacing between the plants can be relatively close so that the leaves of the plants nearby touch as they mature. What I enjoy in raised bed gardening is that monitoring and taking care of your crops during a growing season, is quite an easy task not to mention exciting. You don’t have to deal with muddy walkways between the plants and as the vegetables are placed close together, this will help smother most weeds as a result. Turn the soil over and add in a 1 inch layer of organic matter or compost to work into the soil. Place some black plastic sheeting underneath to avoid any weed growth. A raised bed garden is one of the easiest ways of designing your garden especially if you have poor drainage or if your ground tends to get waterlogged in winter. It’s best to construct retaining walls. You can use materials such as bricks or blocks…. Or 1 inch pressure-treated wooden planks connected to 2 inch square corner posts which is actually quite a common choice. 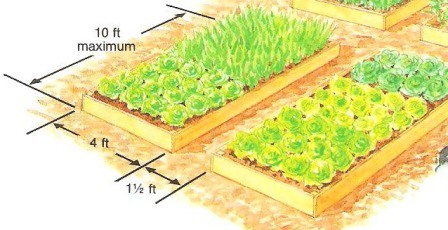 Ensure that your raised bed is no less than 4 inches high. Fork over the bottom and add in a mixture of 2 parts topsoil along with some compost or organic matter. French Beans- The best time to sow them is in May or June. Sow them at about 2 inches deep and space them at 6 inches apart from each other. They should be ready for harvest sometime during July-September. The best varieties to go with are the pencil-podded ones or the continental varieties. Carrots- The best time to sow is anytime during March-July. Sow them at about ½ deep and space them at 4 inches apart. They should be ready to harvest around July-October. Choose a short-rooted variety that will mature quickly like the round Early French Frame. Beetroot- The best time to sow is anytime during April-June. Sow them 1 inch deep and space them at 3 inches apart. Harvest time should be around June-October. The best variety to grow is a globe variety. Harvest them when they’re no bigger than a tennis ball. Lettuce- The best time to sow is anytime during March-July. Sow at about ½ inch deep and space them at 9 inches apart. Harvest time should be around June-October. The best varieties for garden bed designs are Little Gem, Tom Thumb or a loose-leaf variety. Onion- When planting onions into the soil their tips must show. Plant them anytime during March-April. Space them at 3 inches apart. Harvest time should be at around August. It’s best to grow them in sets instead of seed and harvest them 2 weeks after stems topple over. Radish- The best time to sow is during March-July. Sow them at about a ½ inch deep and space them at 2 inches apart. Harvest time is usually around May-September. All of the varieties are good choices. Tomato- Plant tomatoes in June and space them at 18 inches apart from each other. Harvest time is August-September. Your raised beds can be any shape you want in your raised garden design. Take your time and think about exactly what you want from your raised bed garden when drawing up your raised garden design. You can always be creative to make your design interesting to look at as well.